Jason Bonham plotting solo album? Plus: BCC to tour without Bonamassa? 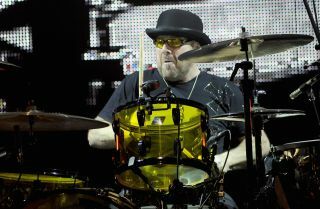 Jason Bonham could be set to start work with an all star cast of guests on a new solo project. The drummer told Classic Rock Revisited: "I've always wanted to do an album with half the people I've worked with. People like Robert Plant, Paul Rodgers, Jeff Beck and Slash. "I've been working on some original songs with the band that does the Led Zeppelin experience. We're going to start writing as an original band and see what comes out of it. It'll be kind of Zeppelinesque because of the way the guys play - but there's nothing wrong with that." He also added that he could still hit the road with Black Country Communion. "I have not suggested this to the others, but my thing would be that we should, for the fans, go out and play. Me, Glenn and Derek. "We could get Joe to recommend a guitar player to go out with us - that way he's still involved. "If Joe can't do it, we should go out with someone else. Joe is a really nice guy and I think if we asked him then he'd say, 'Of course.'" For much more on Jason look out for the December issue of Rhythm, on sale 20 November.